As explained on the Internet web page Corruption Exposed By A Parent, the Schottenstein, Zox, and Dunn (SZD) Law Firm (now Ice Miller) managed to have a parent prosecuted for simply asking two questions (the first as suggested by the Supreme Court of Ohio) about the very serious crimes committed against that parent, his family, and thousands of others involving millions of dollars by the administrators at Worthington Christian Schools (WCS) and Grace Brethren Church (GBC) (i.e. Grace Polaris and Grace Powell) along with their SZD attorney, Daniel R. Swetnam. For more information, refer to the Internet web site ABCsOfBetrayal.com. This Internet web page documents “Your Tax Dollars At Work” after that parent was prosecuted as the SZD (now Ice Miller) lawyers Daniel R. Swetnam and Jay Dingledy continued in their failed desperate efforts to intimidate that parent. Judge's Definition Of The Word "Title"
During and after the sentencing phase, after the parent was found guilty for (frivolous) Telecommunication Harassment, PARENT was sure to get very clear instructions from the JUDGE on exactly what was required of PARENT by law. "You are sentenced to … and two years probation. You shall remove/terminate any websites that reference Grace Brethren Church or Worthington Christian Schools in their title, as such has resulted in indirect contact." "Isn't that a violation of Freedom Of Speech?" "You now have a choice of 1 year in prison or THREE years probation." The attorney of PARENT then requests a meeting outside the courtroom to converse with his client. The attorney tells PARENT that JUDGE only means that the words “Worthington Christian” or “Grace Brethren” cannot be given in the Internet ADDRESS for a web page. PARENT tells his attorney that he thought JUDGE meant that those words cannot be given in the TITLE for or possibly on a web page. The attorney assures PARENT that it is OK to have those words in the TITLE on a web page but just not in the ADDRESS of a web page. PARENT and his attorney return to the courtroom and PARENT tells JUDGE that he did not realize that JUDGE meant the ADDRESS and that JUDGE did not mean the actual TITLE (e.g. the TITLE in the Browser Title Bar or the TITLE on the web page itself). “I apologize if I gave you a hard time about the word title. I thought you meant that I could not have the words Worthington Christian or Grace Brethren in the title of the web page. So you mean that I simply cannot have those words in the Internet ADDRESS, right? 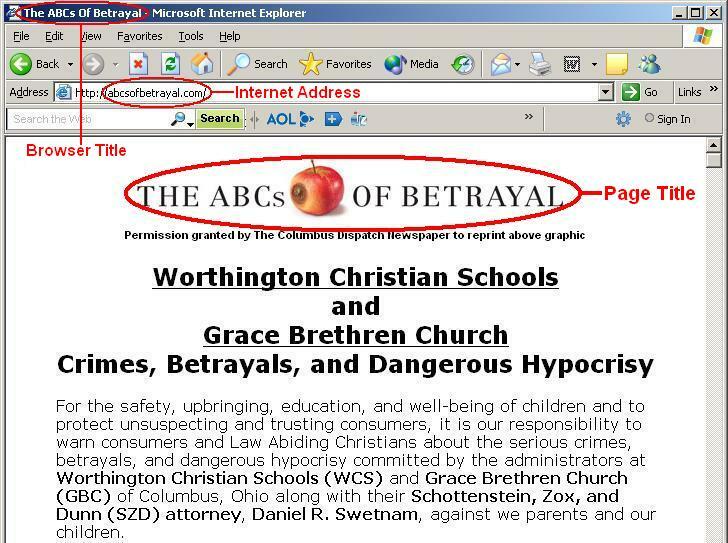 Before 8:00 AM the very next morning, PARENT removed the Internet web sites “worthingtonchristian.info” and “gracebrethren.us” from the Internet precisely as requested by JUDGE. PARENT also had his claim to those Internet addresses removed even though PARENT would receive no refund. PARENT did this to guarantee that he has no association in any way with those Internet Addresses. On January 20, 2010, while exceeding the requirements of his probation, PARENT created a web site in which the Internet address has no association with nor similarities to those of the school and church that got caught betraying PARENT, his family, and thousands of others involving millions of dollars. Note that even though the requirement was only in regard to the Internet Address, the web page also does not include those words in the Browser Title Bar or on the Page Title. Would it be possible to schedule our March 3 meeting for March 1 (Monday) or March 5 (Friday)? I work in Pittsburgh and it is a big disruption of my work to have to take a day off in the middle of the week. I can reschedule your appointment to 3/1/2010 at 8:30 a.m. I will be meeting with you to review your sentence and conditions of supervision. Note that at this moment in time, the Court was fully aware that PARENT is working in Pittsburgh and that PARENT will be at the meeting scheduled for Monday, March 1, 2010 at 8:30 AM. On Wednesday, February 24, 2010, a month after the ABCsOfBetrayal.com web site was created (which exceeded the probation requirements) and just five days before the scheduled Probation Meeting, five (5) law enforcement personnel in three (3) vehicles came to the home of PARENT to arrest him (as he was working in Pittsburgh) and take him to jail. After learning about the apparent warrant for his arrest, PARENT immediately called the Columbus Police who told him to call the Clerk Of Courts to find out if there was a warrant for his arrest. PARENT then called the Clerk Of Courts and learned that there was no warrant for his arrest. PARENT also called Probation Officer Steven M. Downing, but there was no answer. This baffled PARENT who then called his attorney who was not in and so PARENT left a voice mail message. The next day, PARENT eventually learned that he was to be arrested and go to jail for violating the probation rules for the frivolous Telecommunications Harassment he was found guilty for (when he simply asked two questions, the first as suggested by the Supreme Court of Ohio). Three (3) businesses have yet again been disrupted as PARENT had no choice but to stop work and immediately pack up and move back to Columbus from Pittsburgh. The warrant for arresting and jailing PARENT was due to the court not being able to figure out what the definition of the word "title" is as defined by JUDGE and as PARENT got a clear explanation from JUDGE during and after sentencing. "At the revocation hearing if the Court determines that the order was to apply to only the 2 web sites of worthingtonchristian.info and gracebrethren.us that is what I will check to make sure he doesn't repost them. Trust me when I say the time and effort in verifying this web page was created by <PARENT> was enormous. I am not a computer genius so the time and effort to be searching the internet for web pages with "Worthington Christian" or "Grace Brethren" in the title was very time consuming. Please note that I considered "title" to be the title of the Web Page whereas <PARENT> told me he understood it to only be the internet address or web browser title. At the revocation hearing I'll ask for the Judge to clarify for the record. I will be VERY pleased if all I have to check are those 2 web addresses. That's very simple to do and get the message web page cannot be found." On the day of the revocation hearing, Probation Officer Steven M. Downing handed PARENT yet another Statement of Violations (an Addendum). 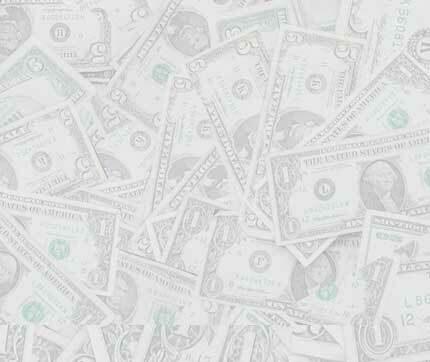 That claim was due to yet another frivolous complaint written by Jay R. Dingledy of the SZD Law Firm. This time Jay wrote that SZD had received emails from lawyers in town which were forwarded to them indicating unsolicited contact from PARENT. NOTE: If you are in any way associated with Worthington Christian Schools, Grace Brethren Church, or the Schottenstein, Zox, and Dunn Law Firm, you are hereby instructed to immediately delete this message and not to respond or forward it to anyone. I apologize for that odd introduction, but I need to ensure that I am in no way violating any probation rules currently imposed on me. I am writing about the possibility of you or someone you know representing me in an appeal case. You may recall back in 2007 that The Columbus Dispatch newspaper did an expose’ called “The ABCs Of Betrayal”. 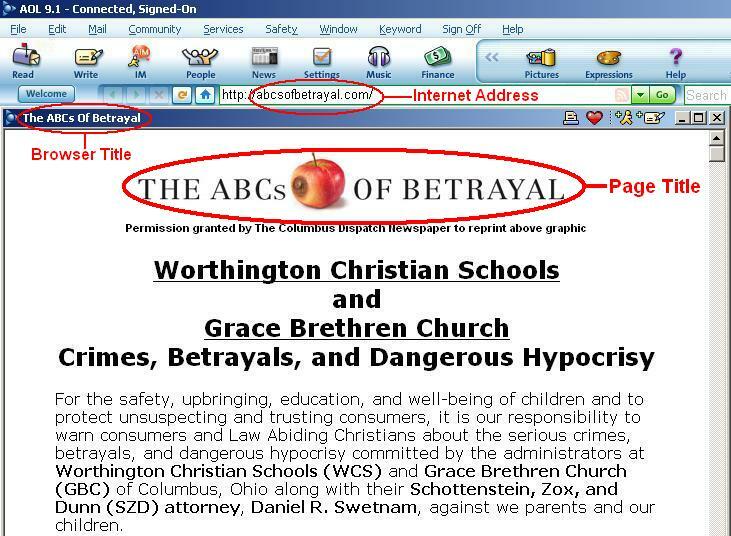 In that newspaper series, the administrators at Worthington Christian Schools (WCS) and Grace Brethren Church (GBC) of Columbus, Ohio along with their Schottenstein, Zox, and Dunn (SZD) attorney, Daniel R. Swetnam, got caught while deliberately putting thousands of students at “risk” (their word) for nearly a decade with several repeat child molesters lead into temptation to molest again, while deceiving and defrauding we parents about it, while the WCS/GBC administrators and their SZD attorney conspired to cover up their crimes (i.e. Conspiracy of Criminal Negligence, Deception, Fraud, and Cover-Ups) against we parents and the students. Please refer to the Internet web site at www.ABCsOfBetrayal.com for the publicly available information. Amazingly, despite the overwhelming and indisputable evidence against the WCS and GBC administrators and their SZD attorney, the Worthington Police and the Columbus Prosecutor, Robert S. Tobias, refused to accept complaints against those administrators and their attorney for the serious crimes that they committed against thousands of students and parents continuously and deliberately for nearly a decade. Incredibly, however, that very same Prosecutor accepted 4 frivolous Telecommunications Harassment complaints filed by Jay Dingledy of SZD against me because I simply asked two questions, the first of which was suggested by the Supreme Court Of Ohio. Please refer to the Internet web page at www.ABCsOfBetrayal.com/Corruption.htm for more information. ACTING KNOWINGLY IS AN ELEMENT OF EACH OFFENSE. KNOWINGLY MEANS THAT A PERSON IS AWARE OF THE EXISTENCE OF THE FACTS AND THAT HIS ACTS WILL PROBABLY CAUSE A CERTAIN RESULT. Note the use of the word “AND” and not the word “OR” in the second sentence above. I did NOT believe that my simply asking a question (Count #1) nor responding to a letter to me by Dan Swetnam (Count #4) would result in me being prosecuted for nor being found guilty of Telecommunications Harassment. If I had been contacted by law enforcement about me possibly breaking any law, I clearly would not have replied to those SZD attorneys contacting me, who were evidently attempting to entrap me. During my prosecution, Prosecutor Robert S. Tobias asked me if I was aware that ignorance of the law is no excuse for breaking the law. No form of law enforcement ever informed me that I was possibly breaking any law. This is no different than being given a speeding ticket on a stretch of road for which there is no posted speed limit. For example, driving 50 MPH on a stretch of road where there is no posted speed limit and only law enforcement is aware that the speed limit is 45 MPH. My deadline for filing an appeal is February 14, so please respond promptly if you would be available to represent me in this appeal case. Because time is critical, it is not possible for me to deal with a long series of “OUT OF THE OFFICE” replies etcetera. Also, if you are aware of any similar incompetence and corruption at the Columbus Prosecutor’s Office, any information about how to break through or go around such incompetence and/or corruption would be highly appreciated. This so we can fulfill our responsibility to have the WCS and GBC administrators and their SZD attorney held accountable in a CRIMINAL court of law for their Conspiracy of Criminal Negligence, Deception, Fraud, and Cover-Ups against we parents and the students. This is yet another demonstration by Jay R. Dingledy that some lawyers (and apparently entire Law Firms) are under the impression that just because they are familiar with the court system and have friends within it, they believe that they can use it and abuse it to intimidate and manipulate those of us who they deliberately deceive and defraud in regard to the safety and upbringing of our children. Not to mention an utter waste of the court’s time and taxpayer dollars for such ridiculous claims. Evidently, some lawyers also believe that they are dictators who can dictate if law abiding citizens can contact lawyers to appeal a frivolous case by those dictators. The Judge dropped both Statements Of Violations against PARENT who then returned to his work in Pittsburgh and continued to be a law abiding and productive citizen and hard-working taxpayer. The SZD (now Ice Miller) lawyers Daniel R. Swetnam and Jay Dingledy had been trying desperately for months to have a parent put in jail; first for following the suggestion by the Supreme Court of Ohio, then again over the definition of the word “title”, then again because the parent contacted appeal attorneys, then again because a newspaper published a Letter To The Editor written by the parent, and yet again for the parent distributing purely factual political information. PARENT was forced to appear in court once again on October 26, 2010 as the SZD lawyers continued to brutally harass that parent and severely disrupt his business. It is quite clear that the SZD lawyers and law firm were simply attempting to intimidate PARENT. The Judge removed wording from the probation requirements of PARENT who then returned to his work in Mount Vernon and continued to be a law abiding and productive citizen and hard-working taxpayer. After the desperate SZD (now Ice Miller) lawyers and law firm failed once again to intimidate and manipulate the parent, the parent was put in jail on January 24, 2011 for informing the public about a group of committed people who discover and alert the public about child molesters and about organizations that knowingly endanger children while harboring child molesters. At additional taxpayer's expense, PARENT was given his very own private room to relax and unwind in with free room service. And the lasagna was excellent! However, on February 1, 2011 after 9 days in jail, Judge David B. Tyack released PARENT from jail and dropped the entire matter against PARENT. This is all very sad, expensive, and foolish and is yet another example of "Your Tax Dollars At Work".